Looking for things to do in CANCUN, the best CANCUN TOURS for all the family? The answer is XCARET Park, one hour away from Cancun and 15 minutes from Playa del Carmen, Riviera Maya. At Xcaret you have access to more than 35 different attractions (included at no extra cost) such as the Coral Reef Aquarium, Museum of Popular Mexican Art, Hacienda (Old Mexican colonial building), the Butterfly Pavillion in their natural jungle habitat. Visit the Mayan Village, followed by the incredible Museum of Orchids and the Edible Mushroom Farm, then go refresh yourself in the clear water of the Underground Rivers. Admire the view of the Caribbean sea from the Rotating Scenix Tower. Don't miss the Island of the Monkeys, Jaguars and Black Panthers. There is also the Manatee and Sea Turtles Lagoon that are a totally worth seeing. 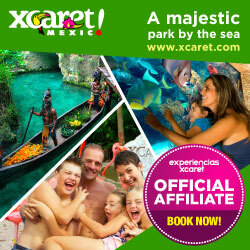 Click on the XCARET image below to reserve right now at the best price. Come to Xcaret Park + Xel-Ha Park + Swim with Dolphins in Cancun Reserve Online Now 10% Off. When the sun goes down in Cancun and Riviera Maya, the best is yet to come! After a great day at Xcaret it's time to head for the theatre. More than 300 artists, dancers, singer and actors will take you on a journey around Mexico. Be a part of the Mayan culture and live the colorful Mexico traditions in the Gran Tlachco Theater at Xcaret eco theme park. Xcaret Night Show is the most amazing representation of Mexico’s national identity and cultural heritage. Do not miss the best Mexico show in Cancun starting at 7:00 pm. Your Xcaret at Night ticket begins with diverse shows with all the benefits of your Xcaret Admission to the Park ticket. Enjoy a lively musical journey through Mexico's history at the most amazing park in Riviera Maya. Admire ancient pre-Hispanic rituals and more than 300 artists on stage, costumes and traditional dances that make the show Xcaret Mexico Espectacular an unforgettable celebration. Appreciate all the nature and culture of Mexico, enjoy the shows and attraction and live all the magic of the Mexican traditions at Xcaret. Submerge in the crystalline waters of a natural inlet and live an unforgettable experience with all the activities you will find in Xel-Há. Revive the traditions of the Mayan culture, dazzle yourself with the charming history of Mexico and enjoy all the attractions inside the eco-archaeological Park Xcaret. Go deep into an underground world and challenge your senses while driving amphibious vehicles through the paths Xplor adventure Park. Visit our 3 Parks: Xcaret, Xel-Ha & Xplor. Cultural activities, sight seeing, snorkel, water sports, Mayan ruins, fine cuisine and adventures.